In this lesson, we will learn how to find unknown information when two or three proportions are compared. Given that 2 1 𝑎 = 7 9 = 𝑏 3 6 , find the values of 𝑎 and 𝑏 . Fill in the blanks: 5 2 = 1 5 ⋯ = 3 ⋯ = ⋯ 1 4 = ⋯ 8 4 5 . If 0 . 8 0 . 4 = ⋯ 7 . 8 = 9 . 5 ⋯ = ⋯ 4 . 3 = 3 . 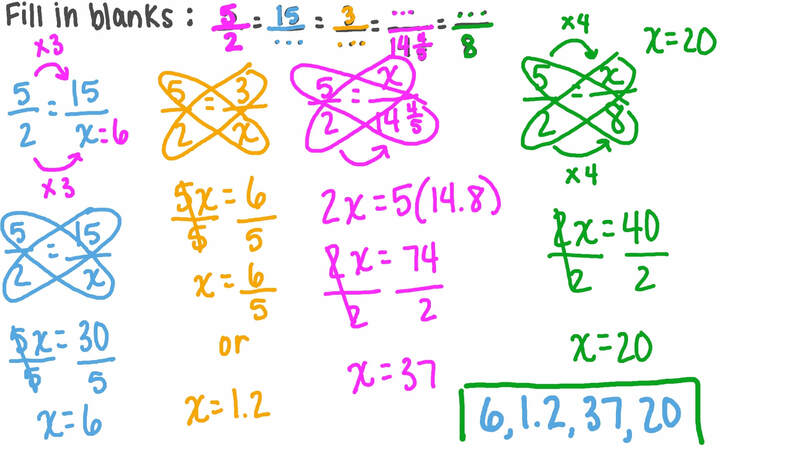 5 ⋯ , use the method of cross multiplication to find the missing numbers. If 2 𝑎 9 𝑏 = 3 2 , find 𝑎 𝑏 . If 2 𝑎 = 9 𝑏 , determine 1 3 𝑏 2 𝑎 . Given that 𝑥 1 5 = 𝑦 5 = 𝑧 7 = 7 𝑥 − 6 𝑦 + 4 𝑧 𝑎 , calculate the value of 𝑎 . If 4 6 𝑥 = 2 9 𝑦 , determine the value of 𝑥 𝑦 . Given that the ratio 1 9 ∶ 1 4 is the same as 𝑥 ∶ 5 6 , determine the value of 𝑥 . If 𝑎 7 = 𝑏 4 = 𝑐 1 4 = 6 𝑎 − 7 𝑏 + 2 𝑐 3 𝑥 , find the value of 𝑥 . If 𝑥 1 9 = 𝑦 1 1 = 3 𝑥 − 𝑦 𝑎 , find the value of 𝑎 . Given that 𝑦 𝑧 = 𝑧 𝑛 = 𝑛 𝑚 = 4 1 1 , determine the solution set of the equation 𝑦 𝑥 − 2 𝑧 𝑥 + 𝑛 = 0  . Given that 8 . 7 𝑎 = 2 7 = 𝑏 4 0 . 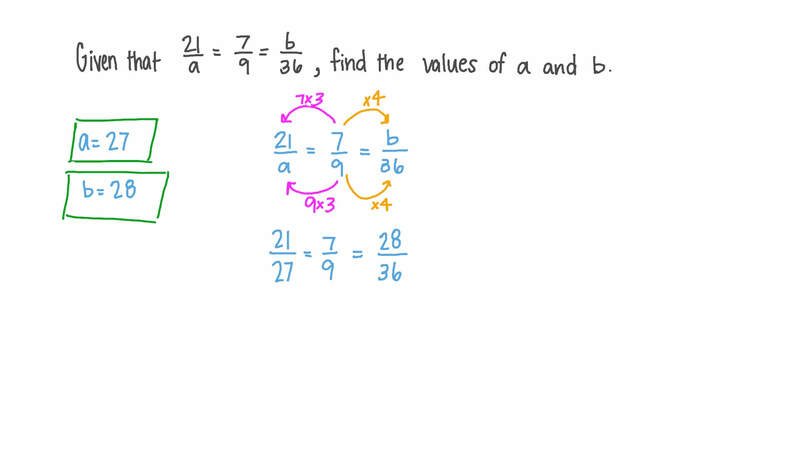 6 , find the values of 𝑎 and 𝑏 . If 1 5 𝑎 𝑏 𝑐 = 5 𝑎 8 𝑏 2 , determine the value of 𝑐 where both 𝑐 and 𝑏 ≠ 0 . If 𝑥 1 4 = 𝑦 8 = 9 𝑥 + 𝑦 𝑎 , find the value of 𝑎 . If 5 𝑥 = 2 𝑦 = 𝑎 𝑦 − 𝑥 , find the value of 𝑎 . If 𝑥 𝑦 = 𝑦 𝑧 = 𝑧 2 = 4 , find the value of 𝑥 . In the box below, corresponding numbers on each row are proportional. Find the values of 𝑎 and 𝑏 . What is the value of 𝑥 , the first proportional of the numbers 𝑥 , √ 6 , 15 and 3 √ 6 ? If 𝑎 𝑏 = 𝑐 𝑑 = 𝑒 𝑓 , then 3 𝑎 + 1 5 𝑐 + 1 2 𝑒 3 𝑏 + ⋯ + 1 2 𝑓 = 𝑎 𝑏 . Find the missing term. If 1 6 9 𝑥 = 1 9 6 𝑦 2 2 , where 𝑥 ∈ ℝ + and 𝑦 ∈ ℝ + , find the value of 𝑦 𝑥 .
𝑎 + 𝑏 𝑎 = ⋯ 𝑎 2 . Fill in the blanks: 1 0 3 = 9 0 ⋯ = 2 ⋯ = ⋯ 1 2 = ⋯ 3 0 9 1 0 . Fill in the blanks: 5 3 = 3 5 ⋯ = 1 0 ⋯ = ⋯ 1 2 = ⋯ 2 7 3 5 . Fill in the blanks: 8 5 = 7 2 ⋯ = 6 ⋯ = ⋯ 1 4 = ⋯ 3 0 3 8 . Fill in the blanks: 6 5 = 6 0 ⋯ = 3 ⋯ = ⋯ 1 5 = ⋯ 2 0 5 6 .